After touring the National Museum, it was time for some lunch, so we inquired about getting to the Panoramic Restaurant. The guide book that came with the ZürichCARD didn't provide details about how to get to the restaurant for some reason. 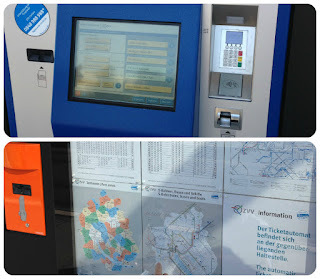 Since we'd left all our printed information back at the hotel, we figured the main train station information booth was our best bet for obtaining directions. They could tell us about how to get there and they also directed us to the tourist information desk for more details about our other plans. 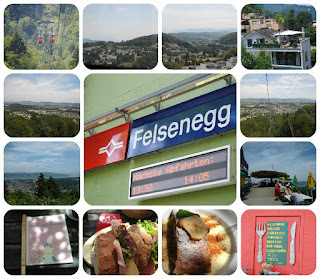 This short trip takes you up to one of the nicest lookout points in the Zurich area: Felsenegg. 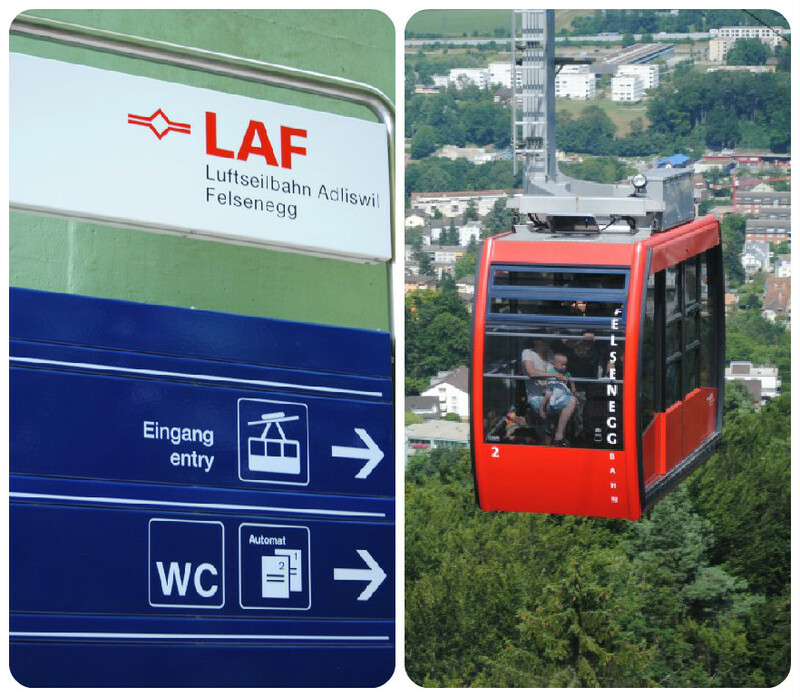 Getting up there is fun, with the only aerial cable car operating in the canton of Zurich. First, take the S4 train in direction Langnau-Gattikon and get off after 15 minutes in Adliswil. 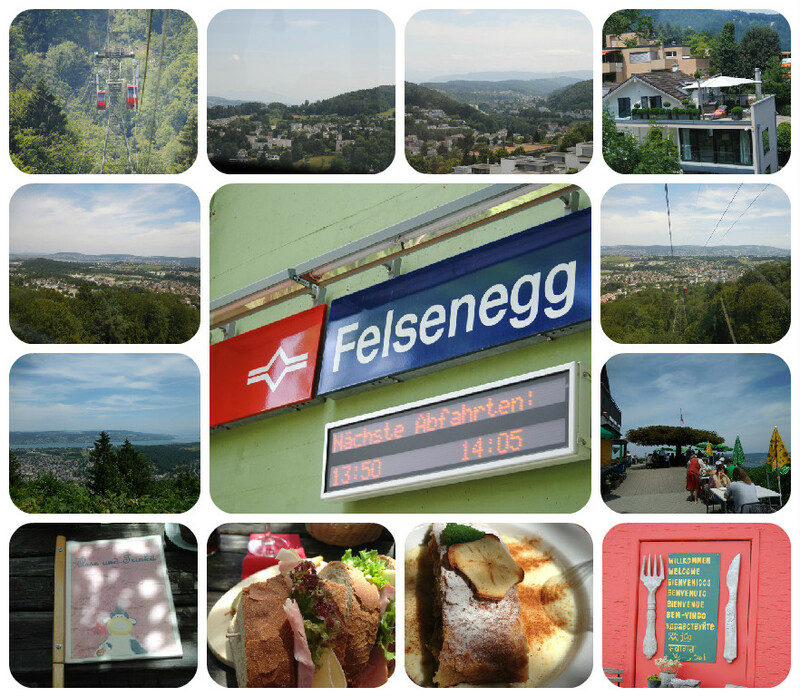 From there it's a well sign-posted 10-minute walk to the valley station of the aerial cable car, which leaves every 15 minutes for Felsenegg. Once you are up there, refresh yourself in the restaurant and of course take in the view of the city, the lake and the Alps. We had ham & Swiss cheese sandwiches with an apple strudel for dessert. It was excellent (and the view was great too). It was well worth the effort to get there. The National Museum Zurich is located across from the train station in the heart of Zurich. This popular museum of cultural history, with its extraordinary 19th century architecture, has been designated a historical monument of national importance. 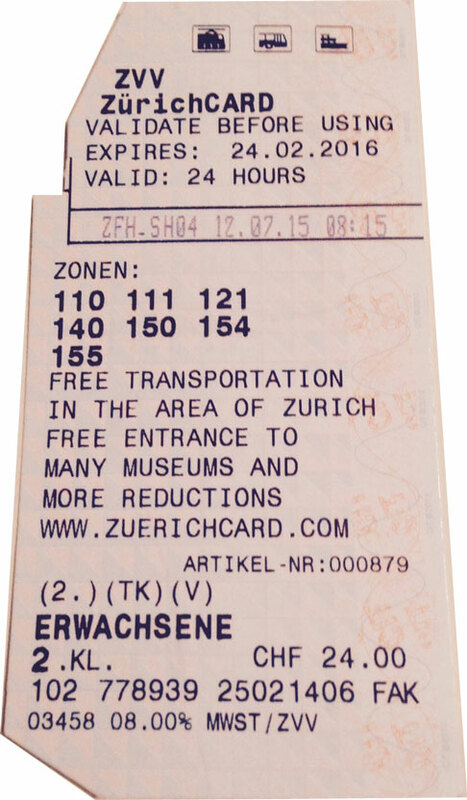 This was our first stop using the ZürichCARD, which gave us free entry to the museum. Note that you'll have to check any bags in lockers that are provided free of charge. You are allowed to take photographs, but please don't use flash when viewing any of the antique art works. With over 820,000 exhibits, the Swiss National Museum has the largest collection documenting the cultural history of Switzerland and Swiss arts and crafts. 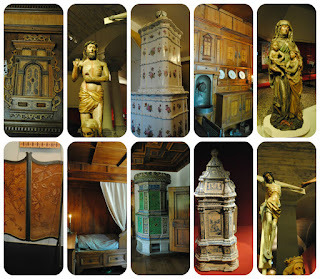 A great variety of period rooms and individual building elements from the 15th to the 17th century. Partially reconstructed in the museum. 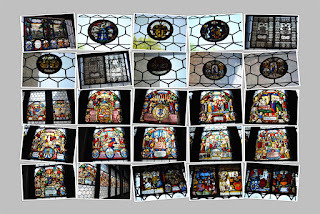 These stained glass windows were just a small part of this collection. 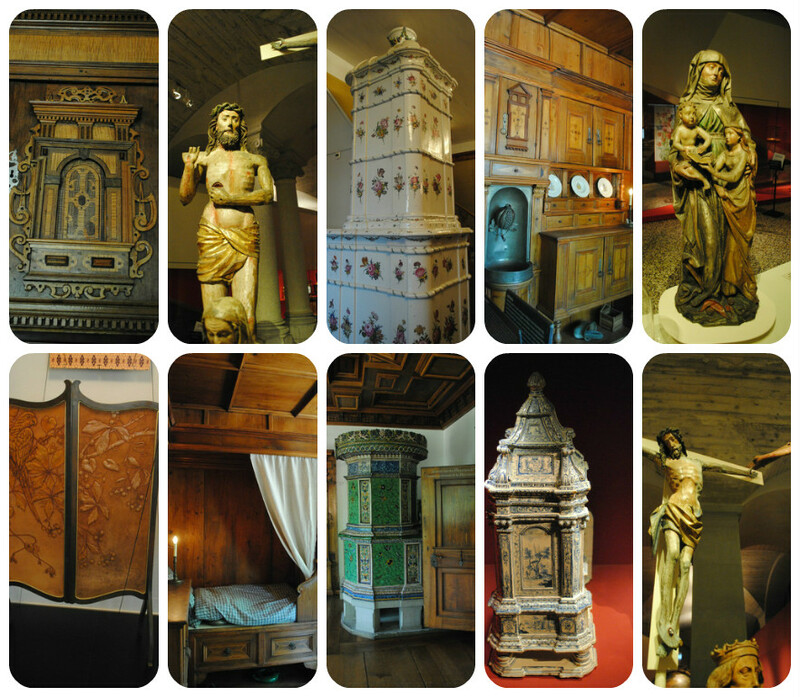 In addition to furnishings, the museum boasts an outstanding collection of medieval wood carvings and framed altarpieces from Switzerland during the Middle Ages. 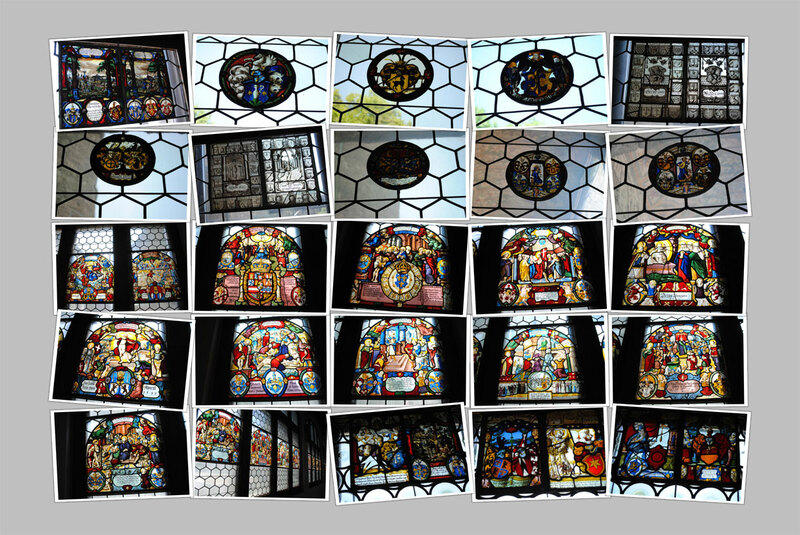 Despite spending quite an amount of time at the museum, we only scratched the surface of all the collections. We highly recommend visiting this museum if you have any interest in learning more about Switzerland's history. 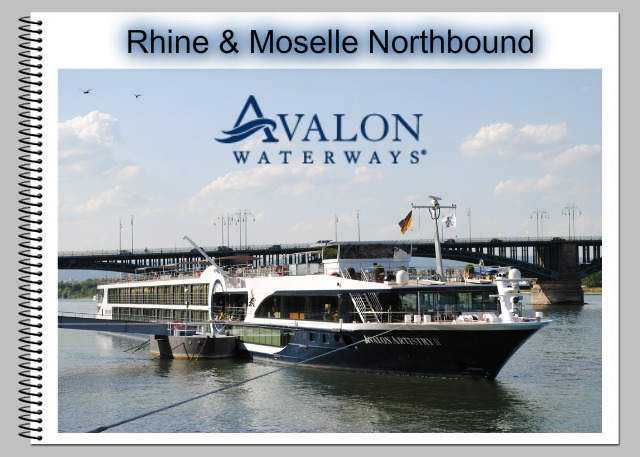 This visit to Zurich was part of our pre-cruise stay before our Rhine & Moselle river cruise on the beautiful Avalon Artistry II. 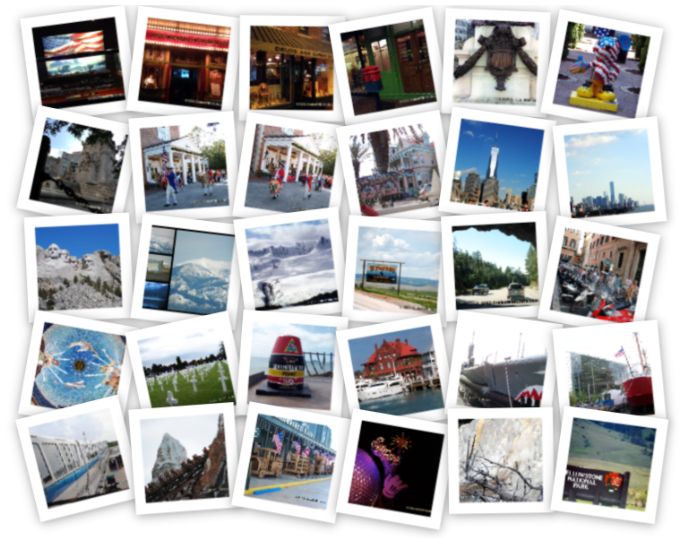 We are writing a complete diary of our trip, with much more to come, including photo albums. Continue with us as we head for some lunch next. 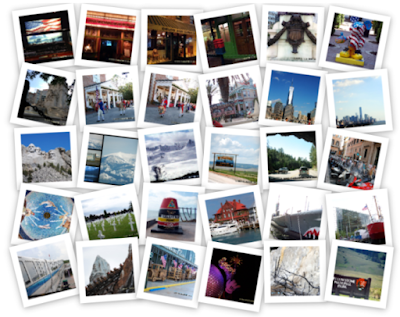 Can you guess where we might be headed (hint: there's a panoramic view from the location)? Click the image to continue the visit other posts in the series. Tip: With the ZürichCARD, you can enjoy Zurich in all its diversity – and save time and money too. We arrived in Zurich, Switzerland one day before our Avalon Waterways river cruise so that we could be accustomed to the time change and have some time to explore the area. 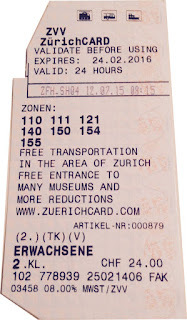 Since we planned to use public transportation, including trams, trains, and boat, plus we wanted to see at least one museum, it made sense to purchase the ZürichCARD. We purchased it at the airport tourist information counter. It can also be purchased at train stations and online on their website. Prior to using your card for the first time, you must validate it at a machine in a train station. Since our hotel had a shuttle, we didn't need to use the card for transportation right away, but we decided to do the validation at the airport's train station. 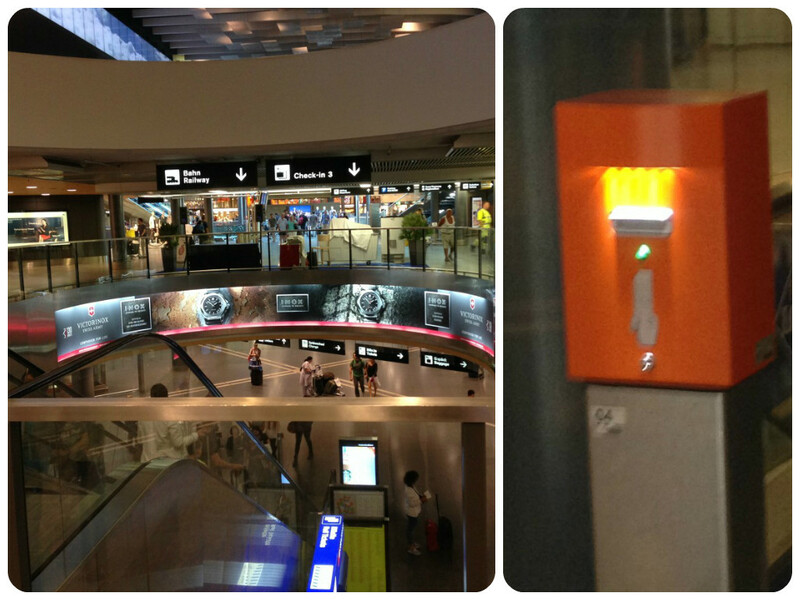 You can find an orange machine, like the one pictured, in the lower level of the train station across from the baggage claim (and tourist information counter). We met another couple, who were also going on our cruise, when we checked in at the hotel. 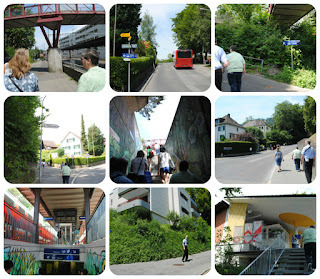 We talked about sight-seeing together and we explained the benefits of purchasing the ZürichCARD. 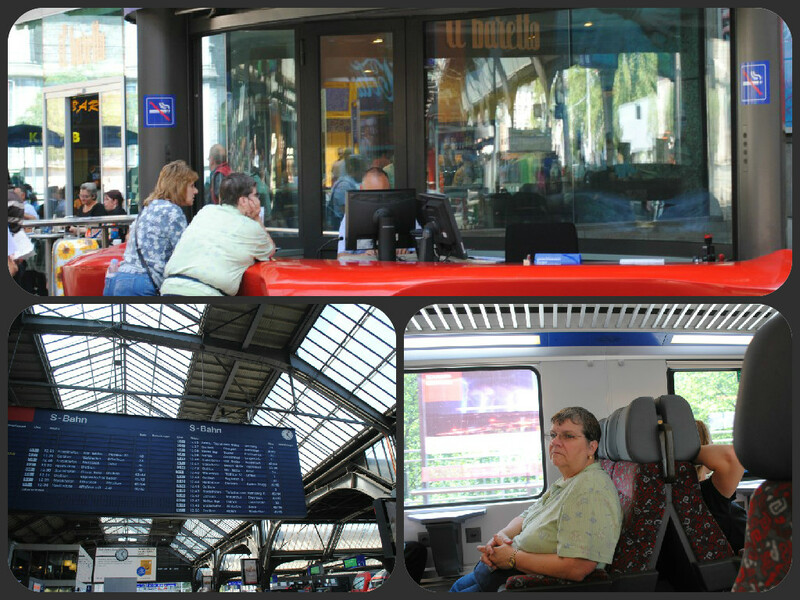 They purchased the cards, using a credit card, from an automated touch-screen terminal by the train tracks. The validation rule still applied - either insert in the orange validation machine (which might be on the opposite side of the tracks) or in the slot to the left of the screen. You can purchase the card for 24 hour or 72 hour periods. As of this writing, the price for Adults was CHF 24 (EUR 24) and CHF 48 (EUR 48) respectively. We only needed 24 hour period in our case. We'll tell you more about how we used the card in additional posts. 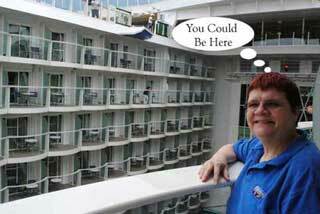 The requirement for the cruise was to be in Zurich, Switzerland by 3 PM on Monday, July 13th for transfer to the ship. 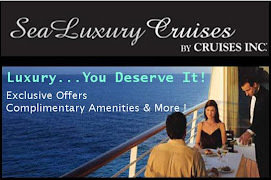 There were pre-cruise hotel stays and excursions also offered by Avalon Waterways. As usual, we prefer to arrive in our disembarkation city at least a day early, especially in the case of trans-Atlantic departures. 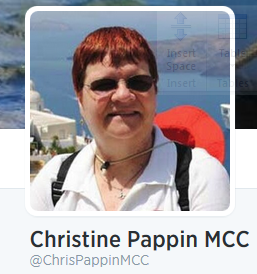 We opted for one night hotel stay and the optional Excursion to Mt. Pilatus with transfer to ship. The flights were booked independently using miles. When using frequent flier mileage for your flights, there are limitations in the flights you can select, especially if you want to minimize the number of miles consumed. In our case, we opted for connecting flights through New York. This added a twist, since the connections included changing planes AND airports. 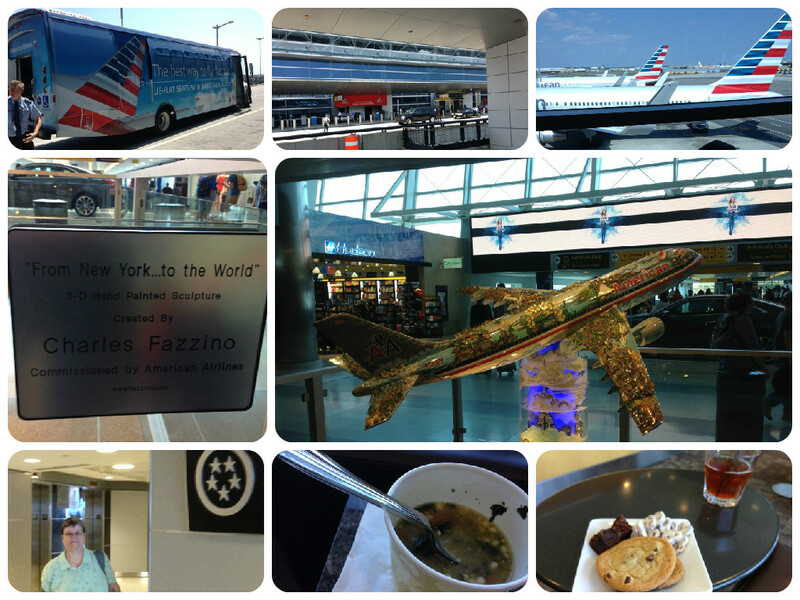 Our flight from Chicago departed Saturday, July 11th at 10:10 AM and arrived in New York (LGA) shortly after 1 PM. 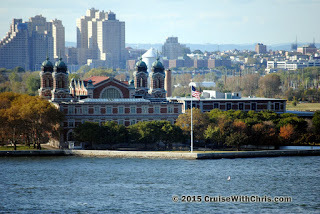 We claimed our luggage and headed for the NYCAirporter counter to purchase transfer tickets to New York's JFK airport. unpredictable, and check-in time at JFK will take quite some time as well. The LGA to JFK transfer leaves the American Airlines baggage claim area every 30 minutes. 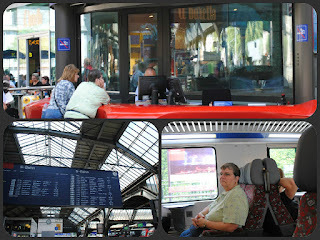 We were able to catch the 1:30 PM shuttle which arrived around 2 PM. We proceeded to TSA security check-in, which had very long lines and took awhile to complete. After passing security, we noticed the sculpture pictured above which was quite appropriate: "From New York to the World". 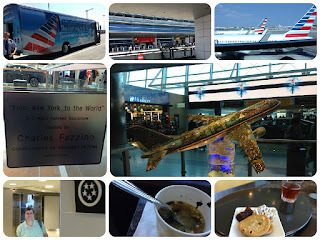 Our next stop was the American Airlines Admirals Club lounge for some snacks before our 4:45 PM flight to Zurich which arrived at 7:55 AM local time. We had an on-time departure for Zurich, Switzerland. 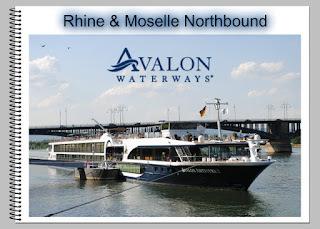 In our next posts we'll talk about our pre-cruise adventures and then continue with more information about this fabulous river cruise. 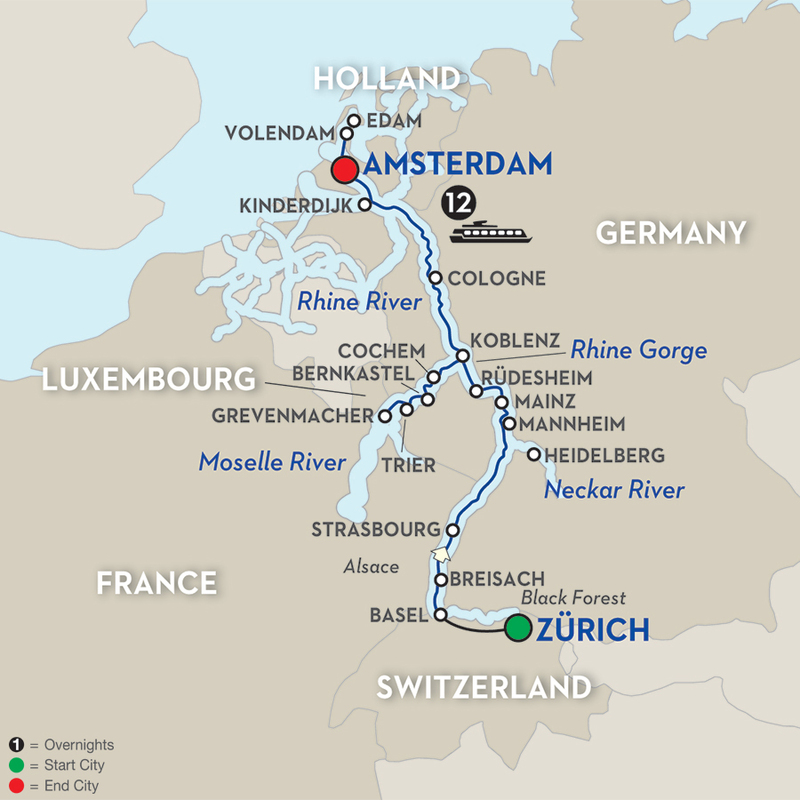 The Rhine flows through six countries (Austria, Liechtenstein, Switzerland, France, Germany and The Netherlands). 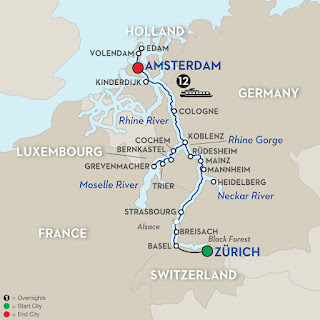 We began our journey in Zurich, Switzerland and ultimately ended up in Amsterdam, Netherlands. 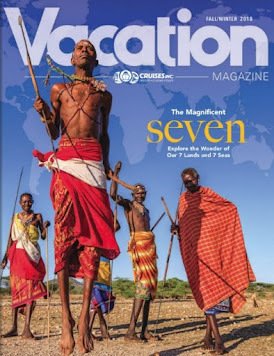 When 2015 began, we had not anticipated taking a river cruise this year, but several events put things in motion which ultimately ended up with our selecting this particular river cruise. 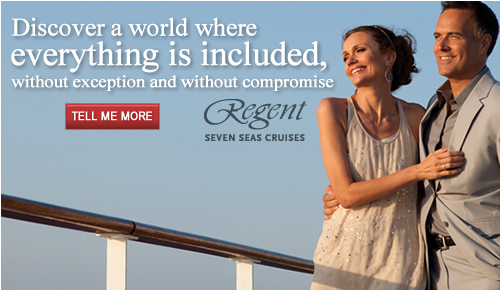 We'll share our story, including the highlights of the cruise. It will take some time to tell the complete story, so we've created this "anchor" page. It will later become an in-depth reference for anyone planning a similar adventure. 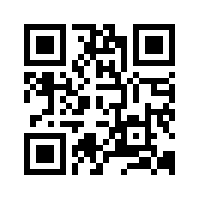 Bookmark this page, follow us on our various social media outlets, and join us on our journey. 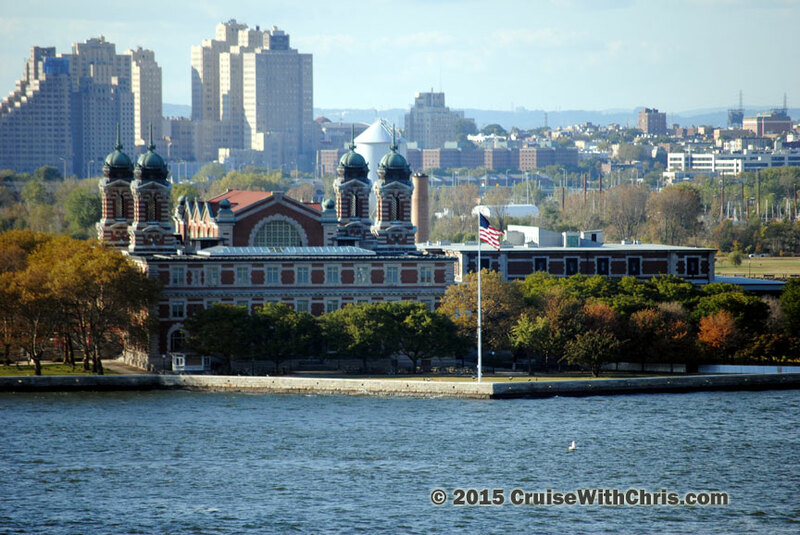 We posted a few teaser images during our cruise on our Facebook page. Now we are completing the story - come back often. 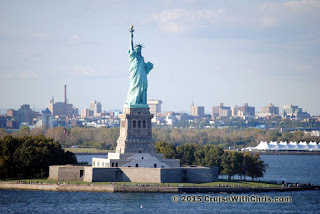 We participated in two Twitter chats, #FriFotos & #travelpics, that centered around America, which was quite fitting with the 4th of July holiday. Canada Day, frequently referred to as "Canada's birthday", commemorates the joining of the British North American colonies of Nova Scotia, New Brunswick, and the Province of Canada into a federation of four provinces (the Province of Canada being divided, in the process, into Ontario and Quebec) on July 1, 1867. 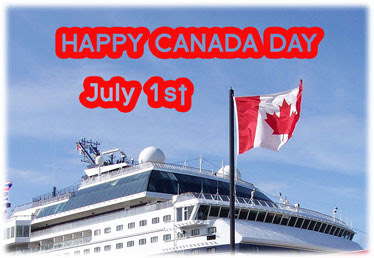 Canada Day is very similar to the July 4th holiday in the United States. Most communities across the country will host organized celebrations for Canada Day, usually outdoor public events, such as parades, carnivals, festivals, barbecues, air and maritime shows, fireworks, and free musical concerts. We have had the pleasure of visiting several Canadian cities during our cruise vacations. 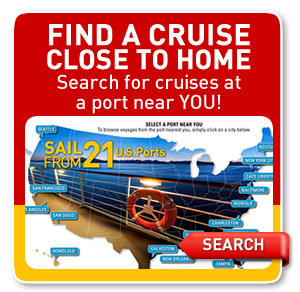 These included ports of call on multiple Alaskan cruises, Canada and New England cruises, and even Transatlantic cruises. 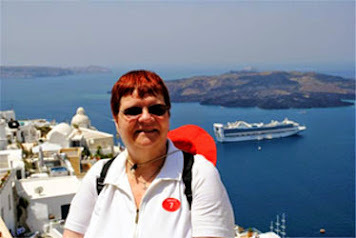 One of the highlights was when we extended our Alaskan cruise with a pre-cruise exploration of the Canadian Rockies. Have you ever ridden on a glacier? You can while visiting the Columbia Icefield Glacier in the Canadian Rockies. 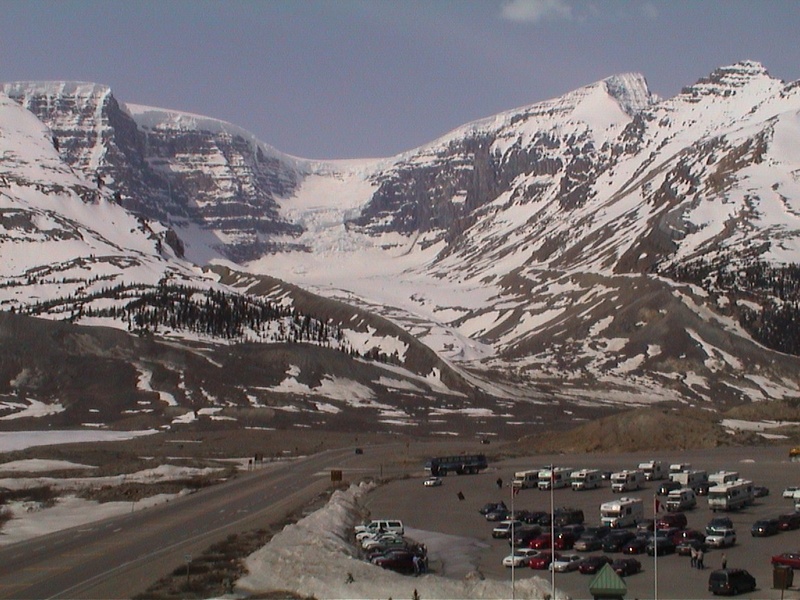 Specially designed vehicles, Massive Brewster Ice Explorers, take passengers on a remarkable excursion onto the surface of the Athabasca Glacier. Have you smelled flowers or gotten up close to thousands of unique flowers in bloom? 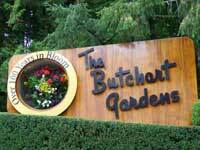 You can at one of Canada's botanical gardens such as the fifty acre Butchart Gardens located near Victoria, British Columbia. You'll see stunning floral show gardens and a National Historic Site of Canada. British Columbia is known for floral gardens. Minter Gardens, which has since closed, thrilled us with thousands of flowers and gardens. 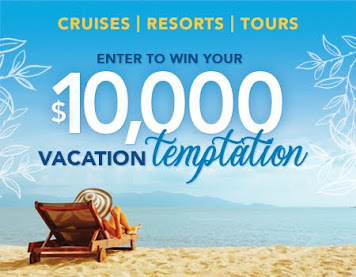 Would you like to visit a fishing village, have some fresh lobster, or visit a lighthouse? Nova Scotia has much to offer including the Bay of Fundy and many beaches where you can build sandcastles, fly kites, take a surf lesson, or just walk barefoot in the sand. For the maritime lover, visit the Maritime Museum of the Atlantic in Halifax, where you can visit the Titanic ~ The Unsinkable Ship and Halifax, Nova Scotia exhibit and learn about the role the people of Halifax played that fateful day. Would you like to walk where birds fly and squirrels hang out? 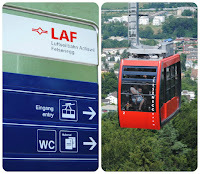 You can in Vancouver, Canada, at Capilano Suspension Bridge and Treetops Adventure. I'm afraid of bridges, but I had a great time crossing a series of elevated suspension bridges, some reaching as high as 100 feet (30m) above the forest floor. Capilano Suspension Bridge is one of Vancouver, British Columbia's most popular tourist attractions. Odds are that unless you extended your cruise vacation in Vancouver, you probably didn't visit this attraction during your cruise vacation. There is so much to see and do in Canada, I hope that you'll plan a visit in the near future and get to know more about this North American country. We have only scratched the surface in this article. 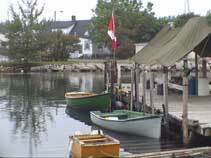 There are other Canadian destinations featured in past blog posts and also on our Facebook Fan Page. To all our Canadian friends .... Happy Canada Day 2015.